The Nicomachean Ethics (/ˌnɪkoʊˈmækiən/; Ancient Greek: Ἠθικὰ Νικομάχεια) is the name normally given to Aristotle's best-known work on ethics. The work, which plays a pre-eminent role in defining Aristotelian ethics, consists of ten books, originally separate scrolls, and is understood to be based on notes from his lectures at the Lyceum. The title is often assumed to refer to his son Nicomachus, to whom the work was dedicated or who may have edited it (although his young age makes this less likely). Alternatively, the work may have been dedicated to his father, who was also called Nicomachus. 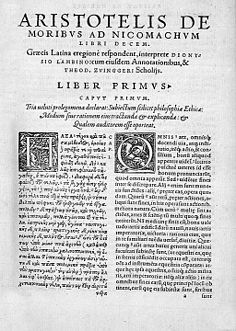 5.4.3 Magnanimity or "greatness of soul"
In many ways this work parallels Aristotle's Eudemian Ethics, which has only eight books, and the two works can be fruitfully compared. Books V, VI, and VII of the Nicomachean Ethics are identical to Books IV, V, and VI of the Eudemian Ethics. Opinions about the relationship between the two works—for example, which was written first, and which originally contained the three common books, are divided. Many believe that these works were not put into their current form by Aristotle himself, but by an editor sometime later. The main stream of discussion starts from the well-known opening of Chapter 1, with the assertion that all technical arts, all investigations (every methodos, including the Ethics itself), indeed all deliberate actions and choice, all aim at some good apart from themselves. Aristotle points to the fact that many aims are really only intermediate aims, and are desired only because they make the achievement of higher aims possible. In chapter 2, Aristotle asserts that there is only one highest aim, eudaimonia (traditionally translated as "happiness"), and it must be the same as the aim politics should have, because what is best for an individual is less beautiful (kalos) and divine (theios) than what is good for a people (ethnos) or city (polis). 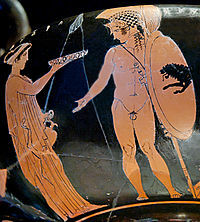 Politics rules over practical life so the proper aim of politics should include the proper aim of all other pursuits, so that "this end would be the human good (tanthrōpinon agathon)". The human good is a practical target, and contrasts with Plato's references to "the Good itself". He concludes what is now known as Chapter 2 of Book 1 by stating that ethics ("our investigation" or methodos) is "in a certain way political". Chapter 3 goes on to elaborate on the methodological concern with exactness. Ethics, unlike some other types of philosophy, is inexact and uncertain. Aristotle says that it would be unreasonable to expect strict mathematical style demonstrations, but "each man judges correctly those matters with which he is acquainted". —  Rackham translation of I.7.1098a. 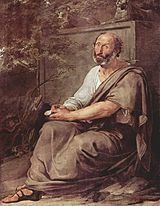 Addressing an opinion that he expected amongst his contemporaries about happiness, Aristotle says that it "seems too unfeeling and contrary to people's opinions" to claim that "the fortunes of one's descendants and all one's friends have no influence at all". But he says that it seems that if anything at all gets through to the deceased, whether good or the reverse, it would be something faint and small. Wishing (boulēsis) is not deliberation. We cannot say that what people wish for is good by definition, and although we could say that what is wished for is always what appears good, this will still be very variable. Most importantly we could say that a worthy (spoudaios) man will wish for what is "truly" good. Most people are misled by pleasure, "for it seems to them to be a good, though it is not". Every virtue, as it comes under examination in the Platonic dialogues, expands far beyond the bounds of its ordinary understanding: but sōphrosunē undergoes, in Plato's Charmides, an especially explosive expansion – from the first definition proposed; a quiet temperament (159b), to "the knowledge of itself and other knowledges" (166e). They are apt to act more high-handedly to a person of high station than a person of middle or low standing, which would be below them. Book IV Chapter 8. The subject matter of this discussion is a virtue of being witty, charming and tactful, and generally saying the right things when speaking playfully, at our leisure, which Aristotle says is a necessary part of life. In contrast a buffoon can never resist making any joke, and the deficient vice in this case is an uncultivated person who does not get jokes, and is useless in playful conversation. It is hard to set fixed rules about what is funny and what is appropriate, so a person with this virtue will tend to be like a lawmaker making suitable laws for themselves. In chapter 3 Aristotle applies to pleasure his theory of motion (kinēsis) as an energeia as explained in his Physics and Metaphysics. In terms of this approach, pleasure is not a movement or (kinēsis) because unlike the movement of walking across a specific room, or of building a house, or a part of a house, it has no end point when we can say it is completed. It is more like seeing which is either happening in a complete way or not happening. "Each moment of pleasurable consciousness is a perfect whole." Domenico di Piacenza relies on this as an authority in his 15th century treatise on dance principles (one of the earliest written documents of the formal principles of dance that eventually become classical ballet). For di Piacenza, who taught that the ideal smoothness of dance movement could only be attained by a balance of qualities, relied on Aristotelian philosophical concepts of movement, measure and memory to extol dance on moral grounds, as a virtue. Finally, Aristotle repeats that the discussion of the Ethics has not reached its aim if it has no effect in practice. Theories are not enough. However, the practice of virtue requires good education and habituation from an early age in the community. Young people otherwise do not ever get to experience the highest forms of pleasure and are distracted by the easiest ones. While parents often attempt to do this, it is critical that there are also good laws in the community. But concerning this need for good laws and education Aristotle says that there has always been a problem, which he is now seeking to address: unlike in the case of medical science, theoreticians of happiness and teachers of virtue such as sophists never have practical experience themselves, whereas good parents and lawmakers have never theorized and developed a scientific approach to analyzing what the best laws are. Furthermore, very few lawmakers, perhaps only the Spartans, have made education the focus of law making, as they should. Education needs to be more like medicine, with both practice and theory, and this requires a new approach to studying politics. Such study should, he says, even help in communities where the laws are not good and the parents need to try to create the right habits in young people themselves without the right help from lawmakers. ^ For Bacon see for example Novum Organum. ^ John M. Cooper, "The Magna Moralia and Aristotle's Moral Philosophy," in The American Journal of Philology 94.4 (Winter, 1973): pp. 327–49. ^ Book I Chapter 6 1096a-1097b. Translation by Sachs. ^ However Aristotle himself seems to choose this formulation as a basic starting point because it is already well-known. 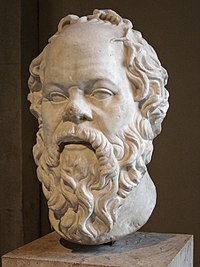 One of the two Delphic motto's strongly associated with Aristotle's own Socratic teachers was "nothing in excess", a motto much older than Socrates himself, and similar ideas can be found in Pythagoreanism, and the Myth of Icarus. Chase, Drummond P. (1911). The Nicomachean Ethics of Aristotle. London: Everyman's Library. Wikimedia Commons has media related to Nicomachean Ethics.